It really bothers me when people who have no real vision or true commitment to the needs of the people they are in place to serve are put in charge of important things. It bothers me even more when they then start obfuscating the truth to hide how these important things have been handled because they dont think the people are entitled to the truth. The National Broadband Network is a critical piece of infrastructure for Australia and is a tool that truly can enable our productivity as a nation in ways we are yet to imagine, just as the internet has. Sadly there is a great deal of obfusaction going on around it! Let me explain the case for obfusaction against the parties involved. Fibre Optic technology to the home was an inspired investment. Fibre is a technology with a huge capacity. The throughput is enormous and the potential for future speed lifts is unimaginable relative to today’s speeds and capacities. The fibre is effectively a data pipe that has incredible capacity to carry data at phenomenal speeds using light. It cooperates very well with very high speed equipment that sends and receives data, and it will be able to continue to work with much cleverer boxes that will be connected to it in the future and handle speeds we haven’t even dreamed of yet. The NBN company is building the fibre pipes and for now is connecting equipment that could have been set to transmit at 1,000 Mbps (Megabits per second). So how does that compare to current market offerings? At our place, we currently have ‘Telstra Cable’. Below is a chart of 3 speed tests done over the last 6 months. 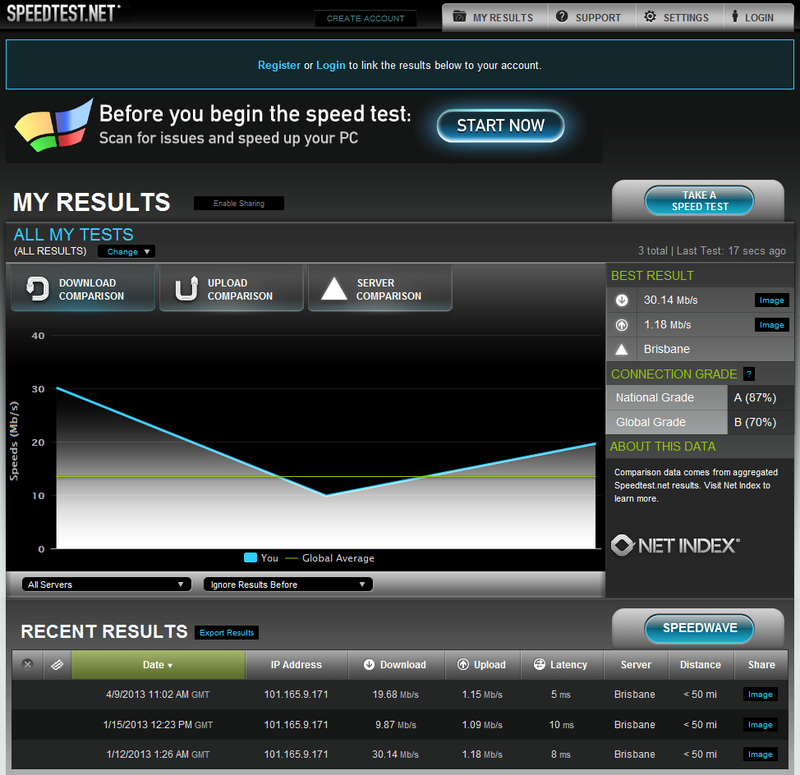 Our cable service averaged 19.89 Mbps and ranged between 30.14 and 9.87. The most common technology is ADSL. Speeds on ADSL range from 1 to 2 Mbps in areas far from the exchange and using older ADSL up to 20 Mbps using ADSL2+ in areas close to the exchange. So any current user should through the NBN have had a potentially serious uplift in performance. More than that, the potential of fibre from the home to the internet is many times the 1,000 Mbps claimed for the NBN once some of the more leading edge transmission technologies are bolted on the end of the fibre. So I hope this helps paint the picture of the relative speeds and potential of fibre versus the current technologies. So now we have an understanding of what the NBN could have delivered. Lets examine the first set of offers from Telstra on the NBN. So on a platform that has been built to offer 1,000 Mbps the top offer coming to the public in residences is 100 Mbps (10% of its out of the gate capacity), and those on a budget will be offered 12 Mbps (1.2% of its out of the gate capacity) no better than ADSL2+. By comparison Google is getting into the Fibre business in the US and is offering the whole 1,000 Mbps that NBN Co could be offering Australia. So why would NBN Co hobble this 37 Billion dollar investment that is supposed to be a strategic advantage for our country? These are the ways of working of the decision makers who have decided to offer Australia 1.2% to 10% of what has been invested in on our behalf. The Liberal Party under Tony Abbott are arguing they are the responsible party who will stop waste and mismanagement are focused on selling a 17 Billion dollar saving and taking away the fibre connection between the residence and the Node/Exchange, and they propose using the existing copper network to connect homes to the Fibre Network and promise they can still deliver 25Mbps (the middle speed in the NBN Co product offer) . Are you offended yet? That’s right, because NBN Co have hobbled what is offered through the product offer to 1.2%, 2.5%, and 10%, it doesn’t seem so bad when the Liberal Party take away the supposed ‘top speed’ of 100Mbps. The average internet user understands none of this and will trust the Liberal Party when they say ‘This is the responsible course of action’. What the Liberal Party are taking away is access to any of the ‘Real Capacity Today’ of 1,000 Mbps or the incredible future capacity when we bolt on new boxes of 1,000,000,000 Mbps or more. Copper will always limit the ability to get any of the real performance out of the Fibre Network. 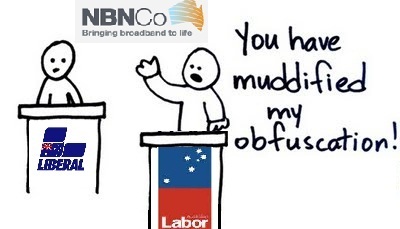 NBN Co’s and Labor’s marketing sleight of hand has created a false sense of what the NBN is. This obfuscation of what the NBN actually is plays right into the hands of the Liberal’s cost saving focus to say ‘well we aren’t losing much’. The truth is that Labor’s 37 Billion dollar investment is an investment. It is being marketed to Australia in a way that lacks integrity, unlike the Google Offer to US residents which gives them 100% of 1,000 Mbps. However it does give us fibre to every home so that when the right marketing offer finally comes we can get the full 1,000 Mbps of today’s commercially available boxes, and in the future can use the 1,000,000,000 Mbps or more that the technologies in development can send down the fibre network. Under the Liberal Policy the fibre network will never give us speeds much more than most of us are already getting from Cable and ADSL2. The only value we get from the Fibre network is that it will handle volume (quantities of data) much better than today’s national network. That is a partial benefit, but the speed component of the investment is totally lost to the residential market, while business can afford to invest in getting their own fibre connection from the premises to the node. Australia has been badly let down by the people involved in pulling together the NBN. Those on the inside will argue that the 12, 25 and 100Mbps equipment is all that can be afforded by the nation. That is totally false. Having spent five years as a CFO in a Medical Device company I learned a great deal about electronics manufacture. The truth is the difference in cost between a 12 Mbps transmission technology printed circuit board and a 1,000 Mbps board is cents if anything. It comes back to marketing. Modem companies price faster modems at much higher prices even though there is no real difference in cost. The only possible real difference in cost is intellectual property and the potential reliance on a patent that might be needed in a 1,000 Mbps board. That is a matter of negotiation. Australia is a nicely defined market with clear borders. The reality is that a good and experienced negotiator would have negotiated the manufacture and delivery of a 1,000 Mbps fibre modem for every home. The scale of the deal would have got the attention of multiple technology providers and it could easily have been pulled off, as it has been by Google. In a ‘Whole of Country Deal’ Australia should never have accepted any supplier’s argument that we should pay more for a 1,000 Mbps fibre modem than a 100Mbps version unless there was a royalty on IP, which still on this scale should not have been an issue. So the most important thing for Australia’s future is that the Liberal Party in this web of lies and obfuscation don’t get away with selling a ‘20 Billion dollar almost total waste’ as a better option than a ’37 billion dollar significant investment’ that sets Australia up to access a network 40 times faster than what the Liberals are offering and which can handle whatever future technology can send down the fibre. Send the Liberal Party the message that their cynical political positioning is not in our country’s interest, and that they need to step away from changing the plan unless it is to deliver what the Fibre can really deliver, namely 1,000 Mbps. There is a Part 2 I will add to this blog in the next couple of days. The other key strategic player having an enormous influence on the NBN is Telstra, and sadly Australians have been sold out to protect this former monopoly.